Four former Los Angeles Jr. Kings – forwards Cole Guttman, Jake McGrew, Jason Robertson and Kailer Yamamoto – were selected in this year’s NHL Draft, which was held June 23-24 in Chicago. 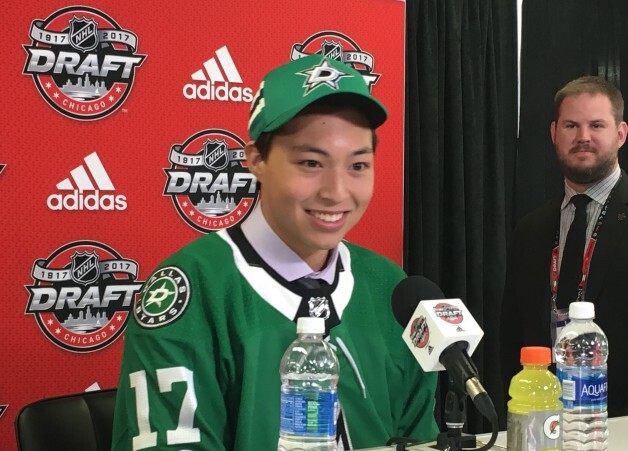 The Edmonton Oilers chose Yamamoto in the first round (22nd overall). Having recently completed his third season with the Western Hockey League’s (WHL) Spokane Chiefs, the forward from Washington led the circuit’s Western Conference in scoring with 99 points, including 42 goals, in 65 regular-season games. The Dallas Stars picked Robertson (pictured) in the second round of the draft (38th overall). This past season, Robertson, from Arcadia, struck for 47 goals and 99 points in 79 regular-season and playoff games for the Ontario Hockey League’s (OHL) Kingston Frontenacs. McGrew, an Orange native who missed his 2016-17 season with the WHL’s Spokane Chiefs due to injury, was selected in the sixth round (159th overall) by the San Jose Sharks. The Tampa Bay Lightning picked Guttman, from Northridge, in the sixth round of the draft (180th overall). In his first full season with the United States Hockey League’s Dubuque Fighting Saints in 2016-17, Guttman, a St. Cloud State University recruit, connected for 28 goals for 58 points in 59 regular-season and playoff games. In addition, two KHS alums – forwards Ivan Lodnia (Anaheim) and Sasha Chmelevski (Huntington Beach) – were drafted with Lodnia going in the third round (85th overall) to the Minnesota Wild and Chmelevski being taken by the Sharks in the sixth round (185th overall). Lodnia compiled 24 goals and 56 points with the OHL champion and Memorial Cup runner-up Erie Otters, while Chmelevski rang up 21 goals and 43 points with the OHL’s Ottawa 67’s.